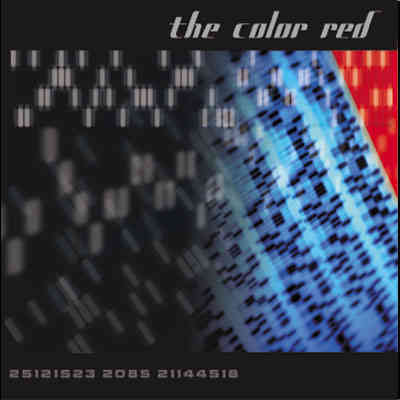 The Color Red is a young, up-and-coming rock band whose songs are melodic enough for easy listener access (that is, they’ve got choruses), but still retain a hard, almost metal edge. The metal element emerges most clearly on this CD’s first track, "Dangerous", which melds the melody of a zillion pop-rock-"punk" bands with the experimentalism and brooding of harder, more reflexively depressive acts like the Deftones. Vocalist Jon Zamora has a more than decent bellow, and he’s got enough sensitivity to articulate the soft parts of their songs too. This is a benefit when your band is, like seven hundred thousand other bands, mining the formula Nirvana mapped out: real soft verse part with the throbbing bassline keeping everybody focused until it’s time to SNAP INTO THE CHORUS AND SCREAM AS LOUD AS YOU CAN WHILE THE GUITARS RAGE ALL ABOUT YOU LIKE A HURRICANE OF HATE AND ANGST AND YOUTHFUL OUTRAGE AND then it’s time to get all quiet again…you know the drill. You’ve heard it before. Well, there’s lots of that here, and lots of sing-along choruses too. Picking a standout track isn’t the easiest task with this record. All the songs are pretty uniform in quality, and that uniform level is pretty high overall. There are no obvious clunkers. Songs like "The Greatest Hits", "Taking Me Home" and "Beginning To Fly" are all solid, melodic, enjoyable tunes which place The Color Red firmly in the tradition of what used to be called "alternative" rock, before the "alternative" started outselling the mainstream and pointing up the general uselessness of genre categorization. What you’d have to call this now would be "rock," and leave it alone after that. The Color Red aren’t innovators, but they’re working capably within an established paradigm; they’re not Led Zeppelin, they’re Grand Funk. Anybody who digs the shiny choruses and loud riffing of a band like Everclear will dig this disc. Frankly, rock these days is like a tidal wave trying to pour itself into a thimble. There’s an almost absurd surplus of bands and only so many hours in the day to listen to music. That being the case, there’s no reason at all why this band shouldn’t provide you with hours of listening enjoyment. Nobody’s ever heard of them, either, which is either a benefit (nobody you know will have this album) or a drawback (nobody you know will have this album), depending on how you look at it. This is a good record to put on while driving someplace, or while partying, or even while sitting around the house wondering whether you should get a job or see how that lottery ticket works out first. These guys have clearly thought out their aesthetic strategy and made their move towards the marketplace, and they deserve success at least as much as some other band with twice the marketing budget. Get this record and skip the new Pearl Jam album; they don’t need your money. The Color Red does, and at least right now you don’t have to read Jon Zamora’s idiotic political ramblings in Rolling Stone, which is always a plus, no matter whether the album is good or not. Which this album is.